Cooking and Kitchen Tips to Save Money – How we cut our grocery bill in half while over doubling our family size, and how you can too. When Mr. Gracious and I first got married, we were spending $200+ every single week for groceries, for just the two of us. I wasn’t sure what I was doing wrong, but I knew we couldn’t keep this up. We were spending far too much on food. Saving money is particularly important to us, living on a single income with a large-ish family. We’ve since gotten our grocery bill down to half of that or less, while also adding three additional people to our family to feed. Yes, that’s right. We now have a family of 5 and average $75- $120 in groceries for the week, including household goods such as paper towels, garbage bags, toilet paper, etc. I made this drastic reduction in our grocery bill without using any coupons or frantically searching sales ads. I just made a few easy adjustments to the way we used the food, and I’m going to share those tips with you. 1. Meal Plan. The biggest money saver I have in my arsenal is meal planning. I know exactly what we’re going to eat and when we’re going to eat it, every single meal, including snacks. There’s no guess work. Not only is this easier on our budget, it’s also easier on my sanity. No more gathering random items out of the pantry in an attempt to make an edible meal. No more last minute trips to the grocery store to pick up missing ingredients. We have quite a few meal planning resources here if you’re wanting to get started. Budget Meal Planning Basics will tell you exactly how to get started planning weekly, or even monthly meals for your family, step-by-step. You can also check out our Monthly Meal Planner, where I do all the work for you. All you have to do is print out the monthly meal planner (updated every single month), make your grocery list, and shop. 2. Shred your own cheese. This might sound a little silly, but here’s the deal. Buying cheese in a block and shredding it yourself is both more cost-effective and more tasty. In my experience, I can pay $2 less per block of cheese for the same amount of pre-shredded cheese. 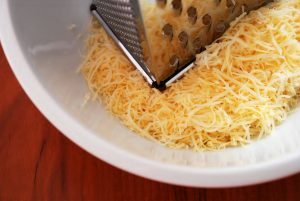 Plus, did you know that pre-shredded cheese is covered in starches (like potato starch and corn starch)? This isn’t detrimental to your health or anything but it does make the cheese stiffer when you try to melt it. Try melting cheese that you’ve shredded yourself, and you’ll immediately see the difference, just like I did. It’s so deliciously gooey and amazing, and even better because you get to save money eating this delicious goodness. 3. Re-purpose stale bread. If you have bread that you accidentally left open or that you didn’t use fast enough, don’t toss it! (Well, unless it happened to mold on you… Then, definitely toss it…) You can use older bread to make croutons, chop it up to make a nice stuffing or dressing, or even process it to make breadcrumbs to use in meatballs or meatloaf. 4. Store apples and potatoes near each other. Potatoes and apples, it turns out, are great buddies. When you store them together, your potatoes will sprout less quickly, giving you more time to use them, preventing waste and saving you money. 5. Freeze your produce. If you buy a bag of onions or carrots, or almost any other produce, but you only need a couple for the week, you can freeze the rest for later use. Just chop up the remaining produce, divide it into cup or half-cup portions, place them in freezer bags, and place in your freezer until the next time you need it. Now you can buy that whole bag of produce that’s on sale without wasting a dime, which will probably save you even more money the next time you go shopping. 6. Find creative ways to use up produce that you don’t want to freeze. I don’t really like to freeze things like bananas or zucchini because they do lose a little bit of their texture in the freezer (though they’re great in the freezer if you’re a smoothie fan!) So I use up produce that’s about to go bad that I don’t want to freeze in recipes that I know we’ll eat right away or recipes that I do like to freeze. Examples are banana bread, zucchini bread, blueberry muffins, blueberry syrup, strawberry cupcakes. We use the breads, muffins, and syrup for easy pre-made breakfasts. The cupcakes are just a delicious treat that my kids always beg me to make. 7. Re-grow produce when possible. We live in the Midwest with harsh winters, so while I wish we had the option to grow a year-round garden, that’s just not possible for us. However there are some produce options that you can buy and re-grow indoors. We have green onions continuously growing in a cup of water on our window sill in the kitchen, for example. Here are some lists and tutorials about which produce items you can easily re-grow: 20 Foods You can Regrow from Kitchen Scraps and How to Regrow Your Groceries. 9. Add pasta and rice. You can get a pound of pasta or a big bag of rice for under a dollar. That’s a huge deal if you’re on a budget! 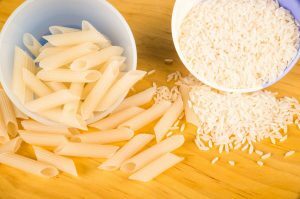 I try not to serve these starchy dishes too often, but if you add it to your meal plan just once per week, it can save you lots! 10. Cook in batches. When I cook, I almost always double the recipe and freeze a portion. This is both for time and money reasons. If I’m already chopping veggies and prepping food, I found that it will really only take me a few additional minutes to chop enough for multiple batches of the same dish, and when I’m done, I now have multiple meals for my family cooked and ready to eat at a moment’s notice. It can also save you money. Instead of buying a bag of carrots for soup and only using three, you’ll now likely use them all. No waste. One less meal you’ll have to cook and buy for next week. It’s something I truly recommend trying. For more on my batch cooking and freezing, you can check out Easy Freezer Cooking for Beginners where I explain some different methods and give tips to get you started. 11. Go vegetarian. No, you don’t have to give up meat completely. I know Mr. Gracious would be none too pleased with this idea. But planning one meal per week without meat can save you lots of money. You can even make your meatless dish also be your pasta or rice dish! That’s a whole family meal for just $2-$5!! 12. Keep track of what’s in your fridge. Go through your fridge half-way through the week to remind yourself of what’s actually in there (leftovers?) and to check on any remaining produce. You may need to bump a meal up a day to use produce that could go bad soon or use leftovers for lunch that have almost hit their shelf-life. 13. Save and freeze chopped produce that you didn’t end up using. This go along with Tip 5, but if you chop up a whole onion or pepper (or almost any other produce you can name), and you end up only use half of it, don’t toss the rest. Place it in a baggy and put it in the freezer. 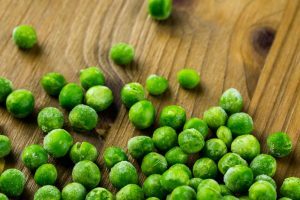 Chances are you won’t need a whole vegetable next time you make the recipe, and you can use what you have left from the freezer to make it again. 14. Use a detailed list for grocery shopping. I talk about this in Budget Meal Planning Basics, as well, but using a detailed, comprehensive grocery list will save you money, save you time at the grocery store, and prevent impulse buys. Write down everything you need to purchase on your shopping list, and then stick to your list! We have two grocery list organizational printables, if you need one. This one is just your basic grocery list printable, and the other one comes with an entire set of printables to create a Home Binder (including meal planning, freezer inventory, and to-do list printables.) Both are completely free, so be sure to check it out! 15. Save glass and plastic containers for storage. I don’t know about you but my tupperware is always disappearing. Instead of purchasing new every month or two, I’ve started saving jars and containers that come with food I already buy (pickle and pasta sauce jars, deli meat containers, sour cream containers, etc.) Most of these are not microwave safe, but they do okay for temporary storage of leftovers. 16. Grow fresh herbs indoors. Never spend money on herbs at the grocery store again. You can bring life to your kitchen and save money by growing herbs in small containers right in your kitchen window. 17. Keep your fridge organized. 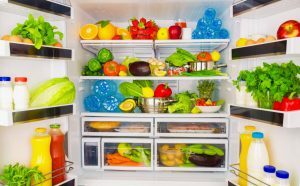 It’s easier to see what leftovers, produce, and perishable items you have and need to use if your refrigerator is organized. You don’t have to get all Pinterest-y creative here with storage bins and cute little labels. Just make sure everything has a specific place, so that you always know where to look for it, and keep the most perishable items towards the front so that you’re reminded to use them every time you open the fridge and see them. 18. Do buy eggs in bulk when they’re on sale. 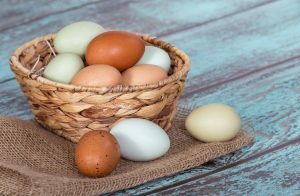 Eggs are a freeze-able item, and a staple to always have on hand, so it makes sense to buy them in bulk when the price is right. To freeze these, break them open and place in an ice cube tray (one egg per slot). Once they’re frozen solid, you can transfer them over to a big freezer bag. 19. Potatoes are another item to buy in bulk. If you can get a 10 pound bag of potatoes for $2, absolutely do it. I would not recommend freezing potatoes uncooked, as they will discolor. But you can make a giant batch of mashed potatoes and freeze in portions in freezer bags. Or you can bake the potatoes and then freeze them to use as ingredients in other recipes. Simply thaw, then chop to use. 20. Get creative with your pantry. Have you ever seen the show Chopped? If you haven’t, you should check it out because it’s pretty cool (It’s on Netflix! You can binge-watch!). Sometimes you’re going to have to do what the Chopped show contestants do. Even if you meticulously meal plan, you might find yourself in a sticky dinner-time situation. Like if you had plans for a date night so you didn’t plan dinner for that night but now your babysitter cancelled on you? Or if you had plans to order pizza because you really just wanted a night off from cooking but your kids shoved a toy fish down the toilet that you couldn’t retrieve and now have buy a whole new toilet, thus totally blowing your budget for the week? Yeah, sometimes life happens and we have to go with the flow. So think of creative ways to use the things that you always have in your pantry. Example? A couple weeks ago I was in a pickle, so I pulled out a random box of hamburger helper from the pantry, but we didn’t have any hamburger! So I grabbed a can of black beans and a can of corn, threw it all together and added some chili powder and cumin, and we had a delicious “Southwest Pasta.” Everyone gobbled it down, and no one was the wiser that I had to just pull dinner out of thin air. 21. Be careful with coupons. Coupons can be great if you know how to use them. However, you’ll also come across coupons for items that you never would’ve purchased in the first place, and those are the ones you have to be wary of. If you just bought a bunch of stuff you’ve never used before and probably won’t use in the future, just because you found a coupon for it, the reality is that you actually just spent additional money that you’re essentially throwing away NOT saving money. 22. Consider shopping at different grocery stores. I currently shop at three different grocery stores to meet our budget and family needs. I’ve compared prices at these three stores, as well as quality, and after a month or so it started saving me loads of money. Here’s what I do. I shop at our local grocery store for produce and meat. It’s the freshest there, and will therefore last longer and the prices are decent. I then take my grocery list on down to Aldi and pick up everything else that I can there, because the quality is excellent and the prices are even better. I also buy ground beef and boneless skinless chicken breasts at Aldi because the prices are better and quality is comparable to our local grocery store. Then I head over to Walmart and purchase anything that wasn’t available at Aldi, completing our grocery list. Now of course, my personal plan won’t work for everyone, but considering shopping at different stores, especially if they’re close together, can be well worth the extra time spent. Plus if you have your grocery list organized (you should! ), the only extra time you’ll spend is some extra driving. Do you have any kitchen tips that save you money? Did you like these Cooking Tips to Save Money? Find more on my Frugal Living and In the Kitchen boards on Pinterest! I had no idea about the apples and potatoes! Great tips, thanks! I didn’t know about the applies and potatoes, either. I always kept fruit in one drawer and the veggies in the other drawer. Thanks for the tip! I actually have a tip! Pay attention to how your produce is stored in the grocery store, particularly if it’s refrigerated or not. I used to throw all my produce into the crispers, mistakenly thinking that cooler temperatures would preserve EVERYTHING longer. Then I’d start to wonder why my bananas, apples,and onions were rotting so quickly. Certain produce releases methanol (the chemical responsible for rotting the fruit and allowing seeds to become planted in nature) very quickly. These fruits and veggies need to stay out of cool and confined spaces because the chemicals need room to disperse, or else they’ll just stay put and rot the produce even quicker. Cool temperatures also prevent it from dispersing properly. If it’s refrigerated at the store, refrigerate it at home. If it’s at room temperature in the store, keep it at room temperature at home. I have a tip, Save All your Vegetable scraps in a zip lock bag in your freezer IE, onion ends and peels, carrot ends and celery. I keep an eye out for roaster chicken and beef bones when they are a good price. Then I just add to a stock pot and let it bubble away. Strain, cool, and store in plastic container in freezer. Another tip for the chicken broth is when the meat is cooked I pick it clean and add the bones back to the pot. I love using the meat for chicken salad and quesadillas! A lot of great ideas! Some suggestions that I do differently and save myself a lot of travel time and money..I will look at both Aldi and another local discount store’s weekly sales ad (both stores are in another town) and then purchase the items that I need at my local Walmart. Most people don’t take advantage of their price match policy. I also watch for clearance meat. Just make sure that you use or freeze it immediately. I discovered that the produce supplier for local restaurants sells to the public and they have a clearance “wall”. I bought cases of fresh blackberries and asparagus for $1.50 each. Check out international grocery stores! There’s a middle eastern store near my home where I get tahini (used for making hummus) at a great price! You can also get large bags of spices for around $3 each instead of $1+ for an itty bitty jar at my usual grocery store. Asian stores are great if you have family members who have gluten issues. I’ve seen a wide variety of rice noodles at very reasonable prices there. Another thing I do: roast my own coffee! I buy green coffee beans online and roast them in a whirly pop popcorn popper on my stove. This won’t save you money if you drink Folgers, but if you are drinking anything Starbucks quality or higher you’ll save at least a little and the quality can’t be beat! I pay between $6-7 per pound. Oh and it’s so good you don’t need any cream or sugar! How about an Ounce of Prevention tip from an old woman (my mother). When you are baking, and as you measure flavorings, such as vanilla extract or liqueurs or whatever, make sure you hold your bottle and measuring spoon over a spare dish. There is no going back after splashing three tablespoons of Peppermint extract into your wet ingredients … and you don’t have any more eggs to make a new batch … and the baby is crying … and these are for the bake sale tomorrow morning … and … and. Watch the greatest cooks and chefs on TV … they never pour liquids separately. They ALWAYS hold the entire full bottle over the bowl and use a tiny, little measuring spoon. I guess the magic of television cures all, but my mother would not be pleased. Oh, and same thing for separating eggs. Crack and separate each one over a saucer first, because even one speck of yolk (as my mother would say) in your whites will destroy your meringue. There is no point trying to fish out a broken yolk from the six whites you have already done. If you lose one egg over a saucer, you can still carry on. So, when you are sure you haven’t broken, you can pop the yolk into a spare bowl for later use, and the white can go into the bowl. About going to three or so groceries especially in summertime. I always keep a cooler or a couple of the large bags like can be purchased at Sam’s or such that have a silver lining that helps retain coolness for the purchases that need to stay cool like dairy, frozen items etc in the back of my car. That way, when shopping, I am always prepared to stop and get some groceries if I need, and they will stay cool til I get them home. For me, shopping at main groceries is about a 25 min drive from home, and if I stop at several stores, I may be leaving items in the car at very high temperatures if it is a sunny summer day. That would make milk spoil almost before it got out of the parking lot! So, Go with a supply of coolers or lined insulated bags, or mix and match to be able to fit more in the car. Then stop at up to three stores, when exiting the store, put the things that must stay cool together in the coolers before going on to the next store. This way, when you get home, the milk, meats, frozen ice cream, etc will still be cold, and stay fresh much longer. We have created an Excel spreadsheet grocery list of specific items we use. It’s four columns – one small followed by one medium then repeated with full outline. When we are out of an item, we just put an X in the small box in front of the item on the list. We’ve left a few empty spots for any non-normal add-ins. We also try to keep it in the order that we walk our grocery store, so all produce is listed together, etc. This has saved us tons of time as well as helping us stay on track rather than buying a lot of extras we don’t really need or usually use. You can make your own hash browns. Cubed or shredded. Peel potatoes (sometimes I leave the skin on). Cut each potato in quarters. If you are giving them you can go ahead. Boil until barely get a fork in the potatoes. Remove. Drain/strain water off. Rinse potatoes. Drain again. Fill with cold water. Place in fridge overnight. Shred quartered potatoes with a grater. The cubed potatoes put in a freezer bag. I usually do this 3 or four times a year. The potatoes keep well and don’t discolor. I make hashbrown casserole and it’s a hit. No preservatives. You can choose to salt potatoes when they boil or as you prepare them later. Enjoy. Soooo easy. I love your post and it just got me excited to try some new things I didn’t know I could do with food! I’ll be starting a scrap garden inside this winter for sure and will be trying to save vegtables that I don’t completely use in the freezer! Thanks for the great tips. I use the blue apples from the container store and put it in the crisper drawer it keeps produce fresher longer . Useful tips on how to save on products, but I think that in some points you can not save. Saving on everything is impossible. But in General, for some of these tips will fall very much to your liking! Thanks for the excellent advice. Great tips! My favourite way to save money in the kitchen is by planning all of our meals and writing a list. You save so much money when you know exactly what to buy at the grocery store!